Brady develops durable solutions to improve safety in the harshest of environments. The company’s products perform in adverse workplaces and defy heat and dust. With decades of experience in extreme environments, Brady’s customers include the world’s biggest names in the mining industry, as well as oil and gas, chemical and steel. Brady is proud of its technical expertise in developing materials and products that cope with demanding, specialist industry conditions. Lockout / Tagout is a planned safety procedure that ensures the de-energisation and isolation of hazardous energy sources. Every maintenance worker has a personal lock in place, so it is impossible to accidentally re-energise equipment, making maintenance procedures significantly safer. Brady offers training in using dedicated lockout-systems for various energy sources and durable padlocks. Durable safety signs help to avoid accidents by communicating vital safety information at the point of need. Brady offers both ready-made and highly customisable signs that are printable on-location for ultimate flexibility and convenience. Brady’s safety signs are resistant to chemicals, abrasion and extreme temperatures, and stay completely legible due to their specially selected design and construction materials, inks and adhesives. Brady offers a variety of safety signs and quality thermal-transfer safety printers. Clearly identified pipes immediately inform employees and emergency workers about the substances involved in an incident. The best practice for pipe marking is to place a pipe marker at regular intervals, before and after every change in direction, and close to valves. Pipe markers also identify the direction that substances flow. Brady offers quality pipe markers that resist a wide range of fluids, as well as the printing systems and software for customers to create pipe markers at their location. Visual Tagging is Brady’s equipment status management system that updates professionals on the status of their tools by displaying the latest inspection information on the item itself. Visual Tagging is unobtrusive and highly visible at the place of need; it helps reduce accidents caused by using faulty or worn-out equipment such as ladders, scaffolds, drills, forklifts and elevators. Spills of industrial-grade liquids have a negative impact in working environments; they can cause employees to slip and fall, and possibly serious injuries. Brady offers clean, flexible and ultra-fast spill absorbents that can be used both reactively and preventively. All Brady spill control products are made from meltblown polypropylene that can quickly absorb up to 25 times its own weight in fluids, cutting down waste disposal costs. Spill control products are available in various shapes and sizes and come in three types, according to whether the fluid spilled is chemical-based, water-based or oil-based. 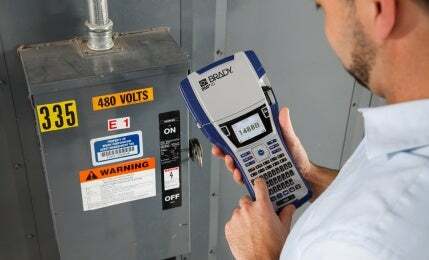 Brady supplies quality label making materials and easy-to-use portable printers to identify any wire, cable or electrical component. Brady’s heat-shrinkable sleeves, wrap-around labels, flag labels, tags and electrical panel labels are tough and durable, ensuring that electrical circuits and wires can be immediately identified, even in the harshest of conditions.